In 1999, Kevin Baugh declared his Nevada house an independent republic. Foxie the dog stayed by her master’s side for three months after his hiking death in 1805. Juan Pujol, Operation Garbo, 1985. Jason Webster, The Spy With 29 Names, 2014. Tomás Harris, Garbo: The Spy Who Saved D-Day, 2000. Stephan Talty, Agent Garbo, 2012. Thomas M. Kane, Understanding Contemporary Strategy, 2012. David C. Isby, “Double Agent’s D-Day Victory,” World War II 19:3 (June 2004), 18,20. Marc De Santis, “Overlooked Reasons Overlord Succeeded,” MHQ: The Quarterly Journal of Military History 26:4 (Summer 2014), 15-16. David Kahn, “How I Discovered World War II’s Greatest Spy,” Cryptologia 34:1 (December 2009), 12-21. Stephen Budiansky, “The Art of the Double Cross,” World War II 24:1 (May 2009), 38-45,4. Kevin D. Kornegay, “Double Cross: The True Story of the D-Day Spies,” Army Lawyer, April 2014, 40-43. Gene Santoro, “Harbor of Hope and Intrigue,” World War II 26:2 (July/August 2011), 26-28. P.R.J. Winter, “Penetrating Hitler’s High Command: Anglo-Polish HUMINT, 1939-1945,” War in History 18:1 (January 2011), 85-108. Neville Wylie, “‘An Amateur Learns his Job’? Special Operations Executive in Portugal, 1940–42,” Journal of Contemporary History 36:3 (July 2001), 441-457. “An Unexpected Threat to the Normandy Invasion,” World War II 31:5 (January/February 2017), 16. “‘Agent Garbo,’ The Spy Who Lied About D-Day,” All Things Considered, National Public Radio, July 7, 2012. Tom Morgan, “Revealed: How a Homesick Wife Nearly Blew It for the British Double Agent Who Fooled Hitler,” Telegraph, Sept. 28, 2016. Adam Lusher, “How a Dozen Silk Stockings Helped Bring Down Adolf Hitler,” Independent, Sept. 27, 2016. Ian Cobain, “D-Day Landings Put at Risk by Double-Agent’s Homesick Wife,” Guardian, Sept. 27, 2016. Mark Torregrossa, “Superior Mirages Over Chicago Skyline Now Appearing,” mlive, April 18, 2017. Allison Eck, “The Perfectly Scientific Explanation for Why Chicago Appeared Upside Down in Michigan,” Nova Next, May 8, 2015. Jonathan Belles, “Fata Morgana Provides Eerie Look at Chicago Across Lake Michigan,” weather.com, April 18, 2017. Listener Jason Gottshall directed us to these striking photos of the Chicago mirage. “5.17a- Supplemental Gregor MacGregor,” Revolutions, Oct. 24, 2016. Brooke Borel, The Chicago Guide to Fact-Checking, 2016. This week’s lateral thinking puzzle was contributed by listener Alon Shaham, who sent this corroborating link (warning: this spoils the puzzle). 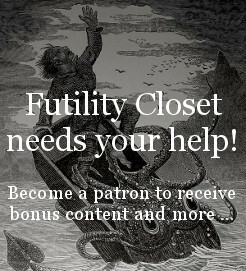 Please consider becoming a patron of Futility Closet — on our Patreon page you can pledge any amount per episode, and we’ve set up some rewards to help thank you for your support.